Hey guys! Welcome to Day 2 of my 12 Nails of Christmas, which I'll be doing here on the blog every couple of days leading up until Christmas. In addition to these posts, be sure to check out holiday themed #CBBxManiMonday posts from Jayne, Renee & Eithne this month as well! I feel like a lot of Christmas nail art can feel like a lot, with bold Christmas colours and designs, and this one just really feels light and delicate in a way that I know a lot of people would love to wear on Christmas. And bonus? It's really easy as long as you're into stamping! This is actually the second time I've done this mani... and I love it so much that I think it might end up a winter staple for me. The first time I did this mani, I actually used a very pale blue créme base, but I decided I wanted to lighten it up even further and use a base that was going to give me a more gel like look to the nails as well as some more interest. After a coat of Unt Ready For Take Off, I went in with three coats of Emily De Molly Nail Color in Stardust, which is a white crelly base with iridescent flakes and some holo dust in it. Ultimately, in this mani, the base ended up disappearing a little bit in photos, but the shift of the flakes in real life was absolutely stunning and the fullness of the formula really gave a gel like look to the nails when I was done. 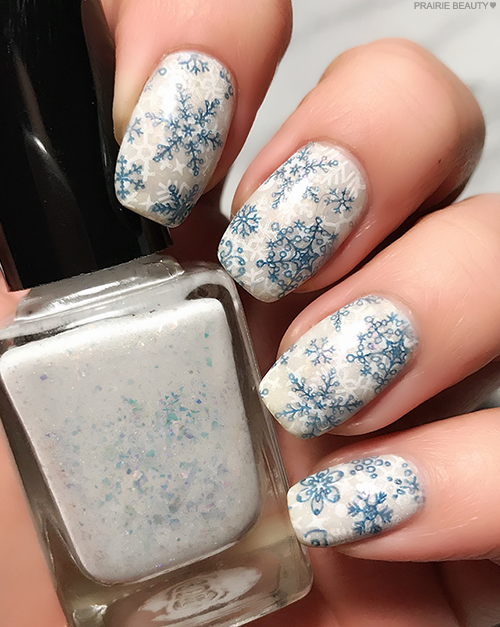 For the stamping, I first went in with BornPrettyStore White Stamping Polish and the BPX-L008 Stamping Plate and used the scattered snowflake image on all four nails. Next, I decided to use Essence The Gel Polish in Royal Blue, which is a deep navy créme polish that shows up a little bit more teal when stamped, for the second layer of snowflakes. 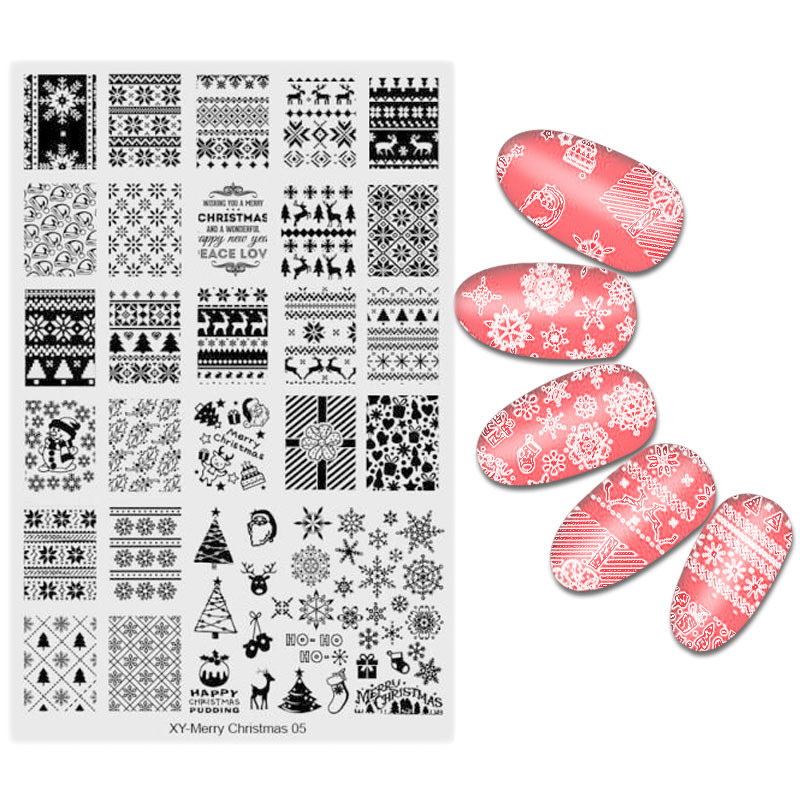 I decided to use the XY-Merry Christmas 05 Stamping Plate for this because it has a large area filled with different snowflakes that I could easily move around the nail to ensure that each one looked different. I like to do this with a full mani of the same stamping so that I get some variation and I really like how it turned out in this one. I finished with a coat of Color Club Matte-ified Matte Top Coat. 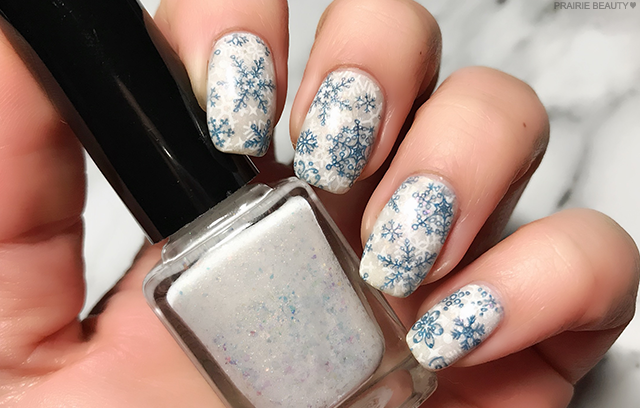 I have to say, I'm really loving cool tones and snowflakes for this holiday season, but I'll try not to hit you guys with too mani snowflake mani's. This one is definitely a favorite of mine and one that I suspect I'll be recreating for a couple of friends and family members for the holiday season. Thanks for reading and don't forget to come back every couple of days leading up to Christmas for more of my 12 Nails Of Christmas. 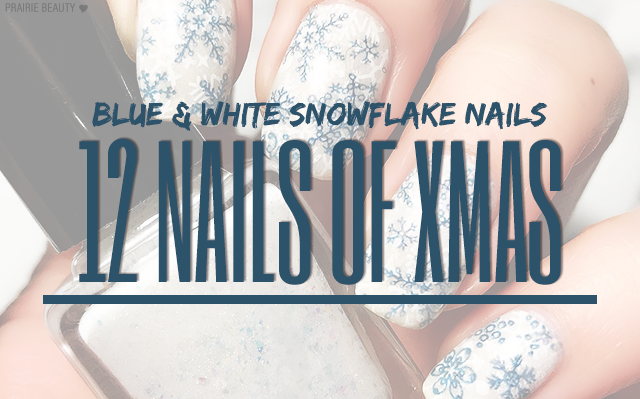 Also, don't forget to check out more holiday nail art over at Cosmetic Proof, See The World In PINK, and Tea & Nail Polish for #CBBxManiMonday!